It’s just a few days away from Super Bowl Sunday, and I still have some great Weight Watchers Recipes that are manly enough for the boys to devour, but still easy on your diet! This Jalapeno Popper Recipe is really easy to make and taste so good that no one will have any idea they are eating a low calorie snack! These fabulous baked and battered little bacon wrapped jalapeno poppers are the perfect Super Bowl Recipe to share on game day. They are low on calories, but high in flavor and are sure to be a huge hit! There is such a nice variety of flavor layers in this recipe and they all coinside together perfectly. I’ve had the traditional fried jalapeno poppers before, but when I tried this baked version of bacon wrapped poppers, I thought I’d died and gone to heaven! Not only did it taste better than the fried, but it was waaaaay lower in fat and calories, so I could really enjoy them! With just 3 Weight Watchers Points per serving, this Bacon Wrapped Jalapeno Popper Recipe is a must have for your Super Bowl party menu! In a medium bowl, combine cream cheese, cheddar cheese and mayonnaise; mix well and set aside. Halve jalapenos lengthwise and remove seeds. (Oil and seeds from the peppers can be irritating — wear gloves or put plastic bags over your hands. And don’t rub your eyes.) Stuff jalapeno halves with cream cheese mixture. Transfer jalapenos to prepared baking sheet and coat with cooking spray. Bake until filling is bubbly, about 30 minutes. Serve hot. Recipe makes 16 Bacon Wrapped Jalapeno Poppers. way too putsie!! 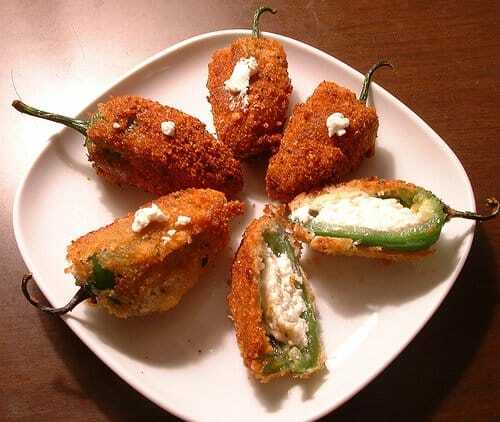 I like to take jalepenos – slice them as above then put in light cream cheese only. Then wrap in turkey bacon. Bake for about 20-25 minutes til bacon is done. Trust me – they are delicious!!!! I've made these with crumbled bacon pressed into the cheese instead of wrapping it in bacon. It was great and since I used the pre-packaged real bacon bits, it was much easier. You can also put these inside a hamburger for the grill :) Makes an awesome popper burger. I was just wondering how many calories (or points) the bacon adds? Where I live, it's hard to find Turkey Bacon very often. Being someone that loves Jalapeno Poppers just with cream cheese… does the bacon really make the poppers, or would they still be awesome without it? If you decide not to use the bacon, don't worry — it's still an amazing delicious recipe without it! I've prepared it a few times without the bacon and they were GREAT! The turkey bacon that I use in this recipe adds only 20 calories to each popper, so it won't make a huge difference if you eliminate it, but if you choose to use regular bacon to the recipe instead, that will add on about 1 -2 Points per serving (which is 2 poppers), so be careful!